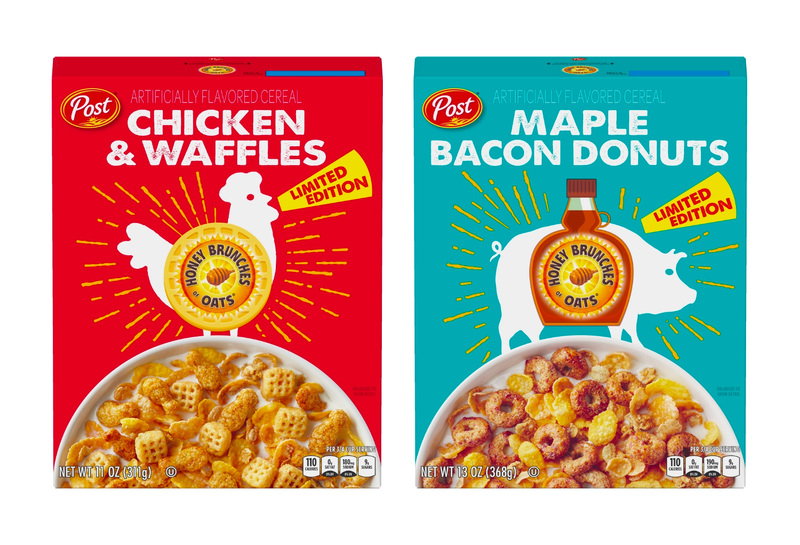 To celebrate National Cereal Day, Post’s popular Honey Bunches Of Oats cereal is taking an unexpected detour into FlavorTown with the introduction of new Chicken & Waffles and Maple Bacon Donuts limited edition flavors. Get a box quick before they go away! Available in limited quantities at these locations. 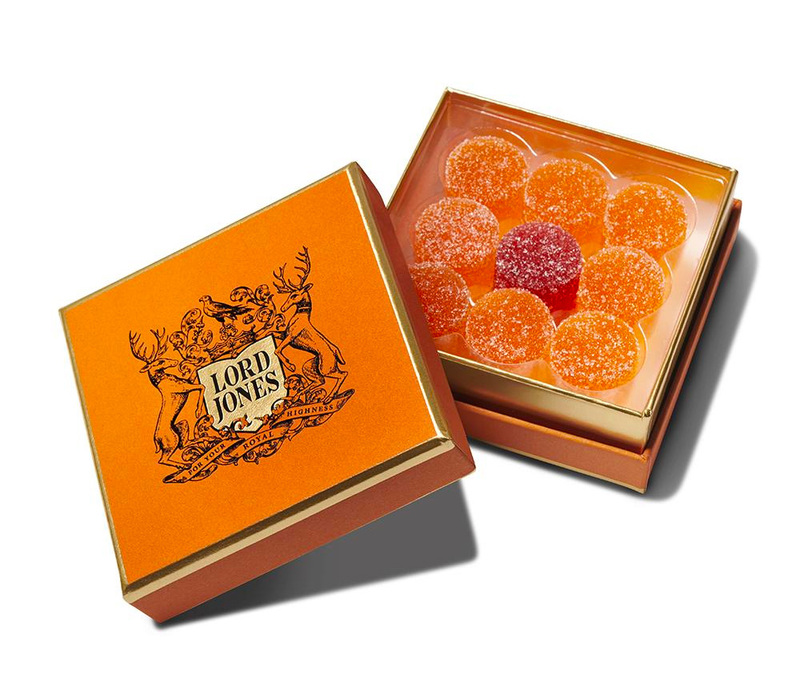 Instead of the stock box of chocolates for your Valentine, Lord Jones has something a bit more healthy. Their Limited Edition CBD Gumdrops are handmade in small batches with natural fruit flavors and hemp-derived CBD extract. Before you get the giggles, keep in mind these are non-psychoactive treats. They contain broad spectrum CBD extract derived from select hemp cultivated in the USA but alas, contain no THC. Combining the tenderness and texture of prosciutto, the lean protein of jerky, and the beef flavor of steak tartare, Biltong is jerky unlike any other. Its origins are in South Africa but a trio of ultra-athlete bros, having become instantly addicted to it there, brought it back to the states. 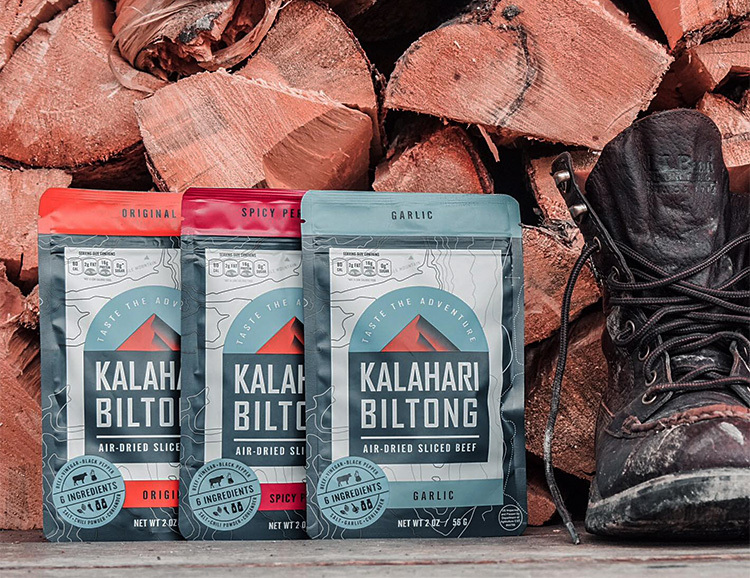 Today their Kalahari Biltong is made right here in the USA using the finest ingredients. It comes in three flavors, all of them Gluten-Free, Sugar-Free, Dairy Free, & Paleo. With Jelly Belly’s latest release, you can enjoy the rich and life-affirming sweetness of a whole box of Krispy Kreme doughnuts without the concerned looks from friends and family. 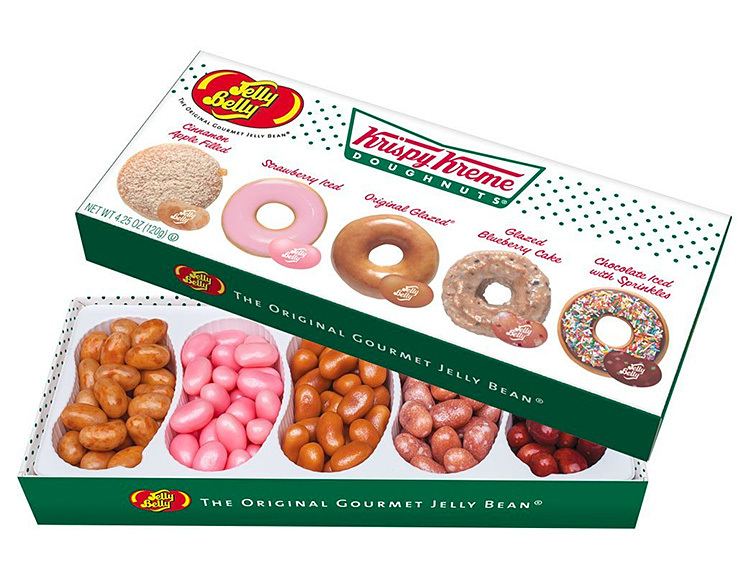 They’ve created an array of doughnut flavored gourmet jelly beans including Glazed Blueberry Cake, Chocolate Iced with Sprinkles, Cinnamon Apple-Filled, and of course the classic Original Glazed. 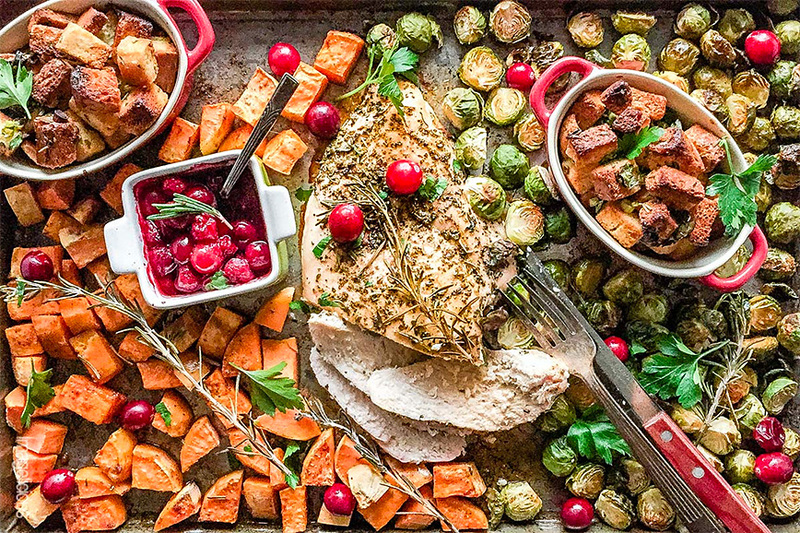 Here’s how you can eat like a king on Thanksgiving but not spend endless hours in a completely destroyed kitchen. This recipe for a sheet pan Thanksgiving dinner for two looks about as easy as it sounds, and cooks everything together—turkey and all the fixins, on a single sheetpan. Try it. You’ll be giving thanks afterwards for minimal clean up. How hot is too hot? Find out with this hot sauce sampler set from Thoughtfully. 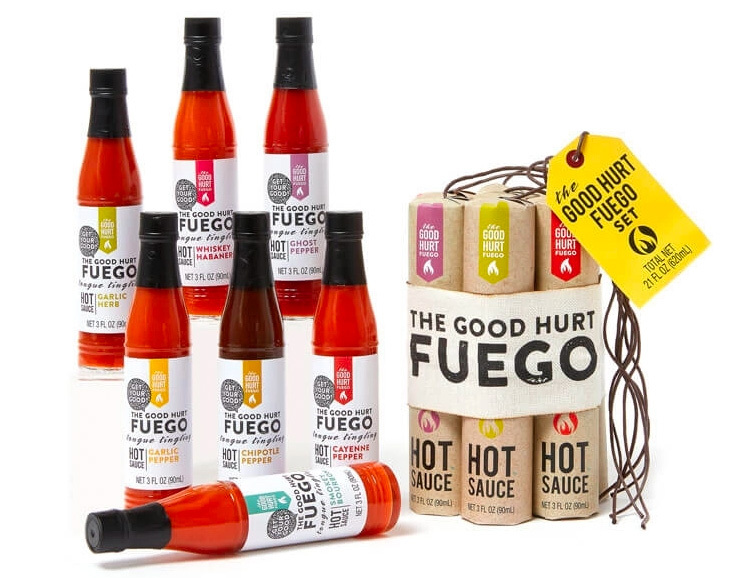 The Good Hurt Fuego hot sauce sampler set includes a selection of 6 artfully packaged 3-ounce sauces that range from mild to face melting, including Cayenne, Garlic, Garlic herb, Ghost Pepper, Chipotle Pepper, Smoky Bourbon, and Whiskey Habañero flavors. How can you go wrong? 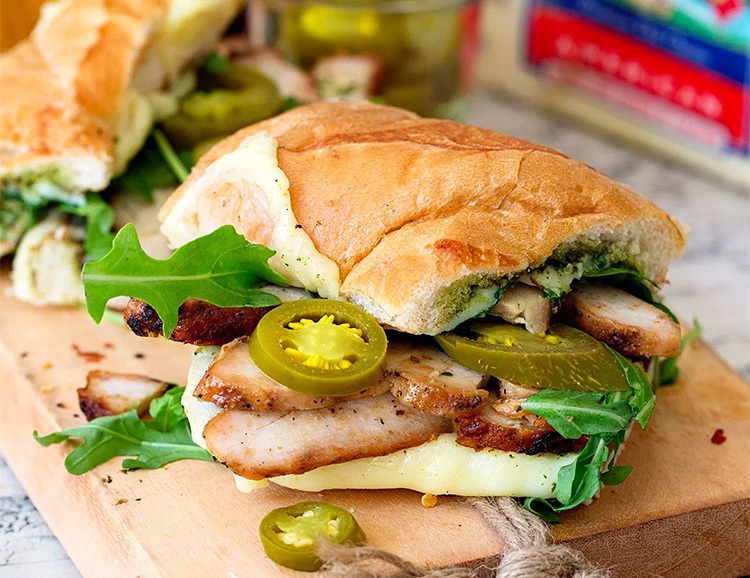 It’s a mouth-wateringly amazing yet simple-to-make sando that’s got all four food groups: chicken, cheese, pesto, and a sub roll. Grill the bird, toast the bun, load it with cheese & pesto, then devour. Simple as that. 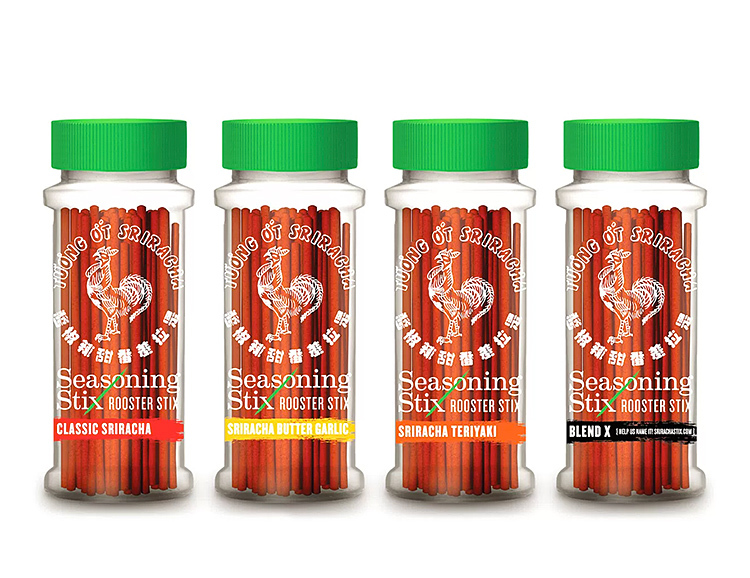 For true fans, you could squirt some Sriracha onto a spoon and we’d call it a snack, so you know we think these Sriracha Seasoning Stix are fire! Designed to add Sriracha flavor to stuff like your favorite proteins, grilled meats & veggies while they cook, you simply throw some stix into the mix & let the flavor & aroma do its thing. They are available in a variety of flavors: Original, Butter Garlic, Jalapeño, and the hotter mystery Blend X. 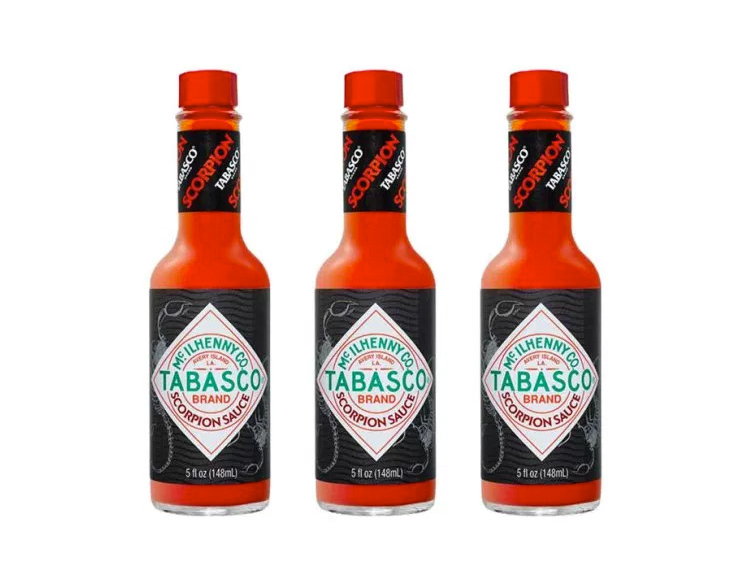 Nearly 20-times hotter than original Tabasco sauce, the new Scorpion Sauce is made with a combination of scorpion peppers—one of the world’s hottest— blended with guava & pineapple that makes for a tangy sauce with untamed heat and a touch of Caribbean sweetness. Not for the wary. 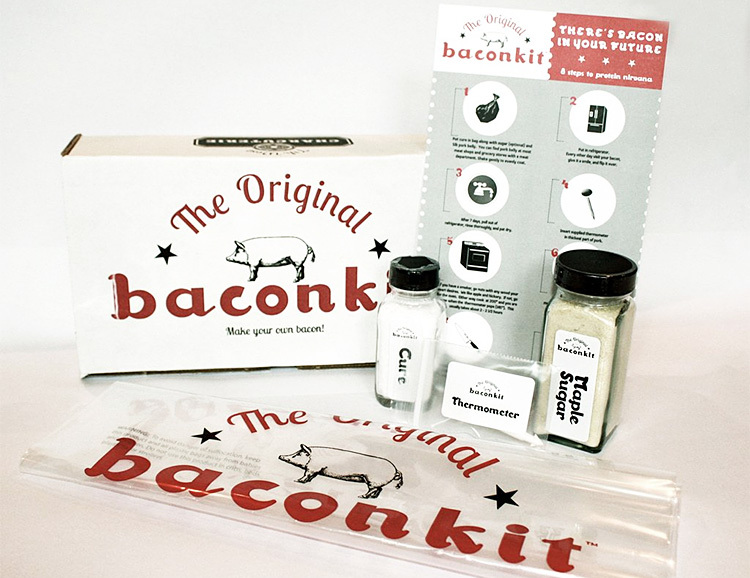 You provide the pork belly and the Original Baconkit gives you everything else you need to make bacon at home. 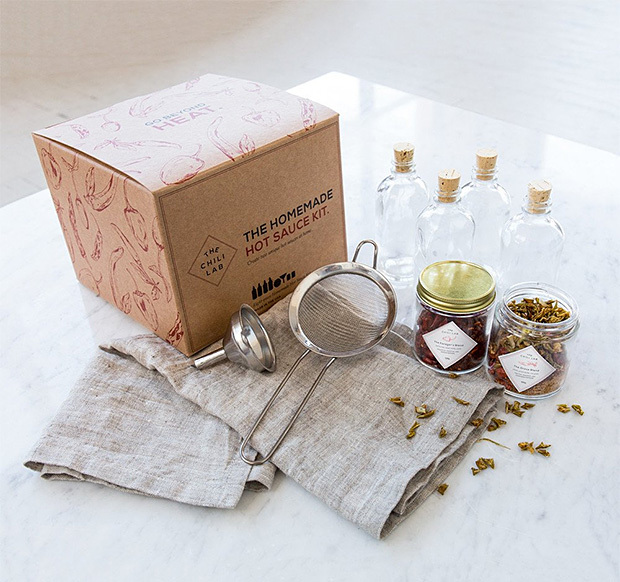 In addition to complete instructions, the kit includes: a curing Bag, pink curing salt, premium maple sugar, and a thermometer. Super easy. Homemade. Why would you not? 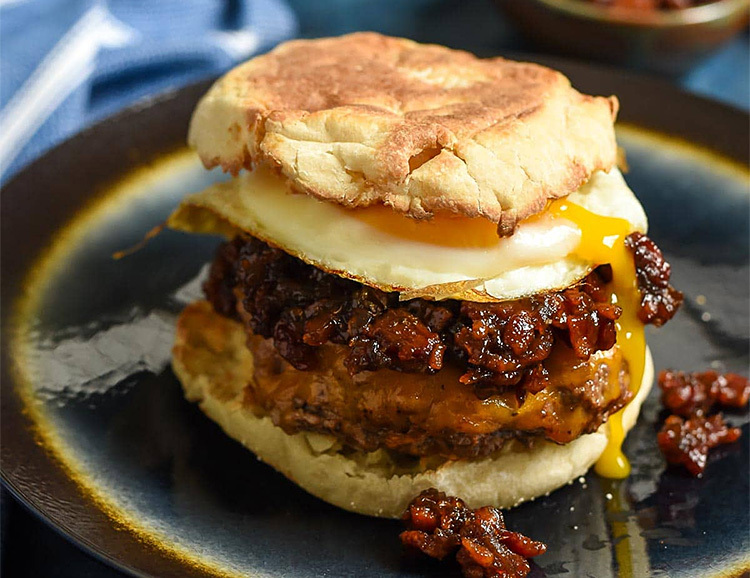 This recipe is proof positive that a “breakfast burger” is not just an odd-hours meal for hungry jetlaggers or graveyard shift zombies. Not even close. It’s a gourmet burger that blends a lean beef burger & an over-easy egg with applewood smoked bacon & BBQ sauce jam. Actually, it sorta sounds like dinner to us. Outfitted with everything you need to make a proper hot sauce at home, this kit from Chili Labs includes 2 uniquely formulated spice blends. Forager’s blend is made up of guajillo, chipotle, and pequin peppers & the Grove blend contains piri piri, anaheim, and habanero which create a yellow hot sauce. The kits also include 4 glass bottles with cork stoppers & tools: a mesh strainer & metal funnel. Sriracha goes with everything and with the new Sriracha Stix, it can now go directly into your meat & poultry while cooking adding that snap of heat & flavor from the inside out while it cooks. Four flavors are available: Classic, Butter Garlic, Teriyaki, and soon-to-be-named-by-fans, Blend X. Yes, you’ll need nachos, maybe some sliders, pizza & of course lots of ice-cold dad sodas but how about cooking up something new on Super Bowl Sunday? 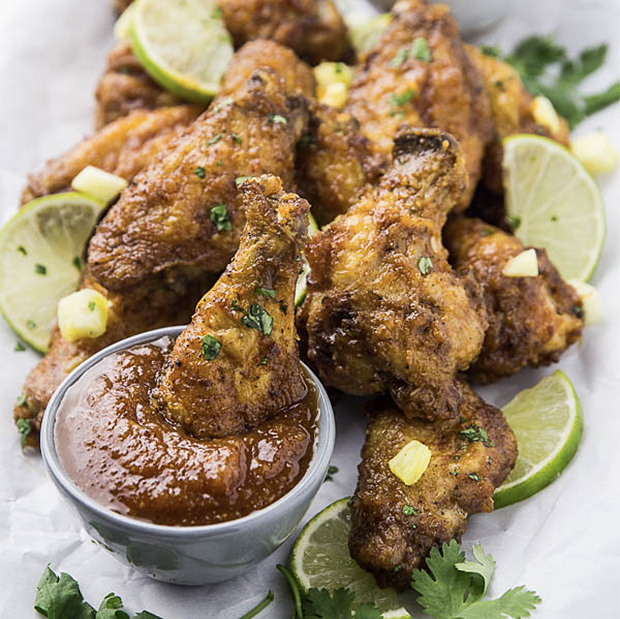 Like, Baked Crispy Cajun Chicken Wings with pineapple glaze. Sounds good & gourmet, right? Well, it is. And better yet, the recipe is pretty simple. Put on your apron & go for the Extra Point. With rare exceptions, we can pretty much all agree that any pizza is good pizza. Mini tortilla pizza most certainly is. 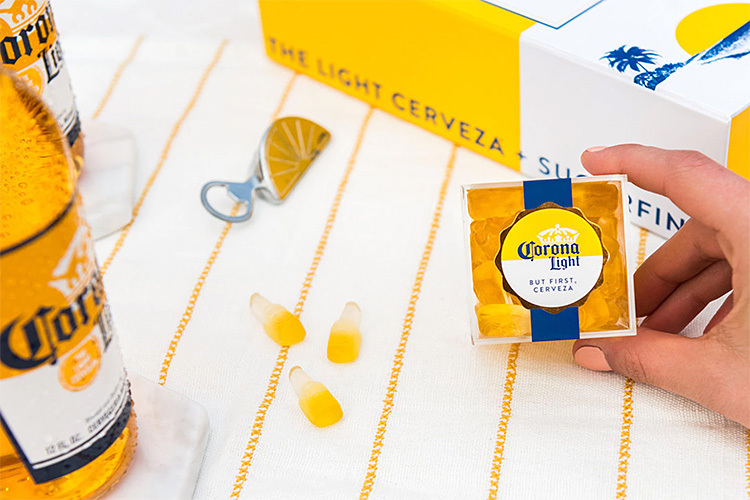 It’s finger-food size, so easy to hold in one hand with a beer in the other. Making them is easy, too. 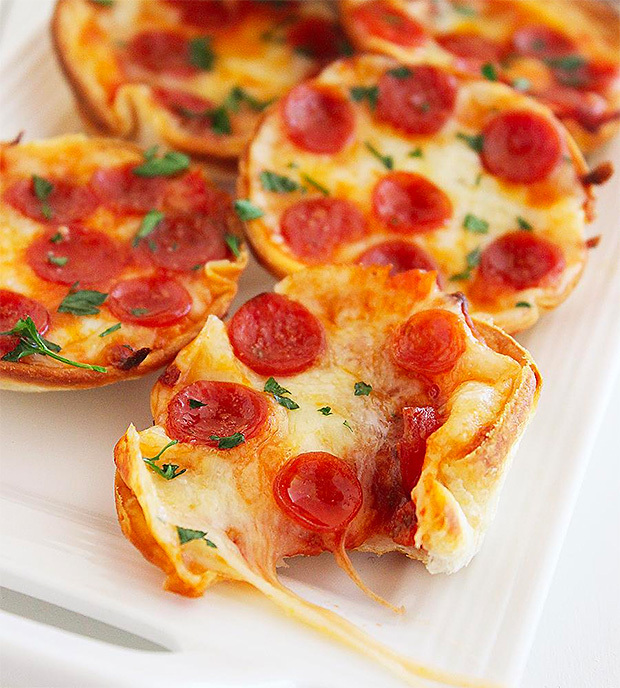 4 ingredients are all you need: tortillas, sauce, cheese, & pepperoni. Wanna add something else? Do it. 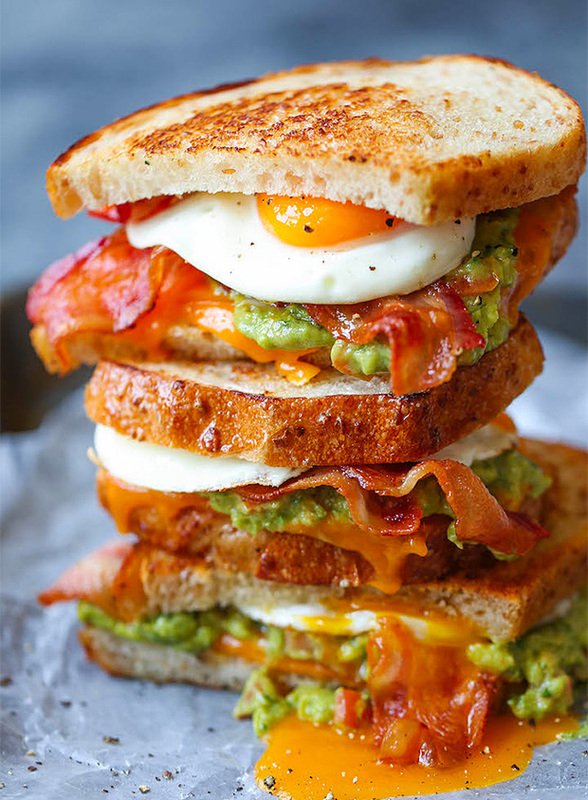 You really shouldn’t need instructions or even the suggestion that adding guacamole to a breakfast sandwich can transform your morning meal. But here is our public service announcement nonetheless: Do it. Add guac. Click VIEW RECIPE for the whole spiel. 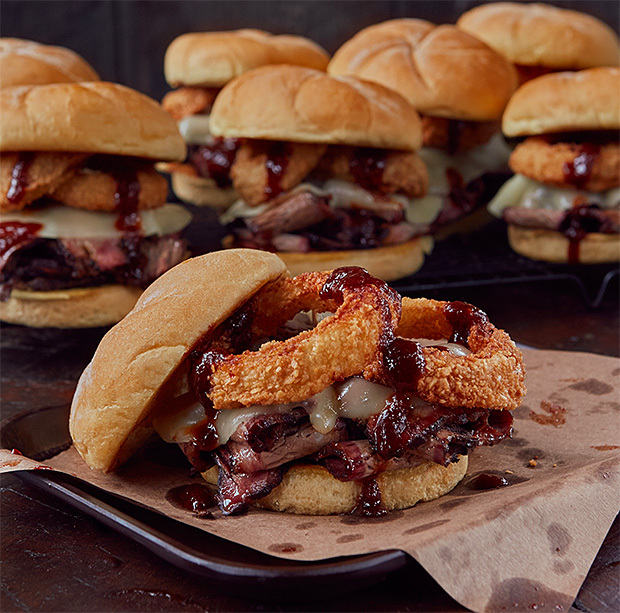 Z-Man Kits bring the unmatched goodness of Joe’s Kansas City Bar-B-Que right to your doorstep in complete packages that include all the ingredients you need to make an authentic Joe’s sandwich at home. Choose from brisket, pulled pork, or chicken. Each kit makes 8 man-size sandos. Generally speaking, homemade chili is pretty simple to make. All the ingredients go into one pot, add spices, and just let it do its thing. 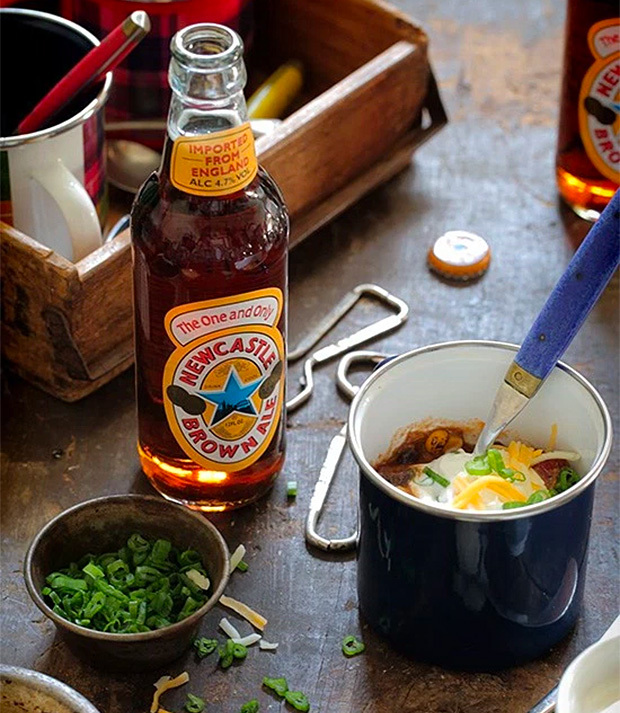 This recipe ups the ante with the addition of a bottle of Newcastle Brown Ale, which is proven to give the flavor of chili a little extra snap. 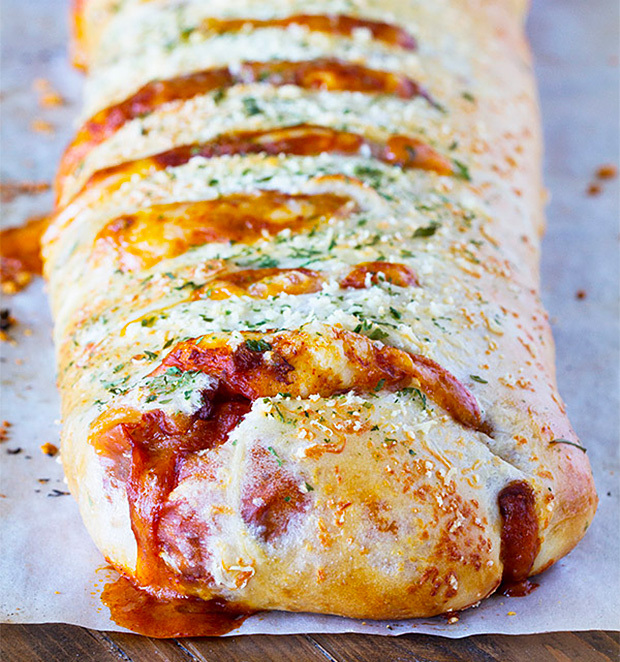 Creatively combining two certified superfoods: chili & pizza comes this recipe for Chili Cheese Stromboli. It’s basically a chili-filled pizza rolled up like a jelly-roll and baked to cheesy, gooey goodness.